Doug Peterson says ‘One of my first questions when I meet an educator is what’s the address of your blog?’ Doug’s JISC piece lists reasons for having an online presence. These include blogging for research, employability and simply yourself. One of the reasons I hear for not blogging is not having anything to say. Really? Nothing? Doug says there’s no such thing as a bad blog. Well, with respect, I disagree. There are plenty of blogs which are too long, too wordy and plain boring but I get his point. Better to blog badly and have an online presence rather than not at all. It’s about digital engagement. Social media are creating niche networks within higher education. Activities like blogging and tweeting emphasise divides between those who do and those who don’t. The gap is getting wider but it’s largely invisible. Like attracts like. If you do it’s with others who do. If you don’t you are less likely to be reading this in the first place. This week I picked up from a tweet a piece in THES by Bob Harrison about making FE more of a digital experience. Here is the same old language of technology transformation. ‘Hopefully says Bob, ‘this time the transformative potential of technology for learning will be recognised rather than ignored’ People have been saying this since 1997 and the Dearing Report into the future of higher education. Today’s use of technology is mostly limited to uploading documents to a VLE. While this offers 24/7 access to information, the VLE can do so much more in terms of collaborative interaction. The problem is shifting from a repository approach to an activity one. 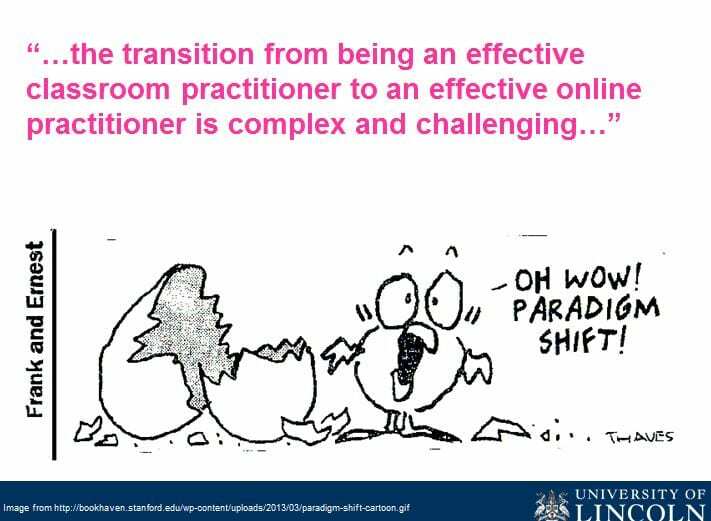 Bob says we need ‘critically, refreshed workforce skills’, a ‘paradigm shift in how learning programmes are designed, delivered and assessed’ (cue favourite image!) and it’s ‘important to remember technology-enhanced blended learning is not a cheap option.’ We know all this. It’s the doing it which is the problem. The article linked to an Opinion piece in the TES about teaching digital literacy. Matt Dean says ‘FE needs to work out how to teach digital literacy.’ It was reminiscent of the 2007 blog post about technically illiterate teachers. The question for Matt is not should we teach digital literacy, but how to do teach it well. Good question but Matt is writing about students. The academic staff perspective is missing. HE have the same issues. I think we need to go back further and look at how teachers develop their own digital skills and identities in the first place. To see digital capabilities as ways of being and seeing as well as knowing which buttons to click. Digital divides are growing but for most institutions, access has become less of an issue than meaningful engagement. This is where help is needed. Rather than ‘teach digital literacy’ in isolation, it should be embedded in the curriculum to help ensure digital graduate attributes. 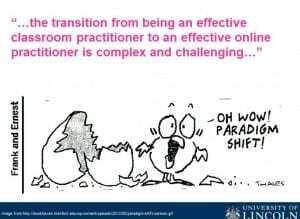 In staff development and teacher education programmes to support staff trying out digital pedagogies and practices in safe supportive environments. We not only need to change what we do but change how we think and this is the challenge. The third floor corridors of the MHT Building are looking better for a new coat of paint (although it seems slightly mad to do this while staff and students are trafficking by). The collection of framed film prints and posters in the stairwell also look good. I was intrigued by The Wild and The Willing, filmed in Lincoln in 1962. The plot outline on IMDB didn’t hugely appeal but out of interest I watched the first segment on YouTube (1/12). Like all vintage films it provides a snapshot of the social and cultural attitudes of the day; in particular, local reaction to having students in their midst. Prophetic or not? Watch and make up your own mind! Last weeks THES ran an article on the demise of virtual worlds in HE. I have mixed feelings about this. Earlier in the year I attended a conference in Second Life (http://tiny.cc/kmEkQ and http://tiny.cc/PSYaw) and concluded it had the potential to provide a powerful learning experience but this had to be offset by problems with access. While many UK universities have an SL campus it was rare to visit and meet anyone. Similarly with recreations of cities or simulations designed to raise awareness of issues such as schizophrenia; dressing up in a toga in ancient Rome may be great fun initially but the experience is fundamentally unsustainable. I don’t know what the current usage is but in a similar BBC article a few weeks earlier, Technology, Twitter and the downturn, says SL traffic has declined by 67%. The THES article quotes Dr Lowendahl as saying lecture capture and retrieval is taking over from podcasting and elearning repositories. Podcasting always was problematic in terms of access as transcripts were rarely made available, as were elearning repositories with no quality assurance and/or attention to inclusive practice. While the traditional lecture transitions poorly to an online environment the idea of capturing and indexing may be a step forward but I wonder who will take on those roles not to mention quality assure and make accessible 50 minutes of videowith associated captions/subtitles/textual alternatives? Moving on, Dr Lowendahl also says that e-books are currently top ‘of the peak of inflated expectations’ in 2009. Concerns about ebooks and readers are well documented here on this blog. So I wonder what predictions can be made for technology enhanced learning in 2010? Well, here’s one. How about using more effectively the tools we already have? The good old VLE, now embedded within systems and support, provides a virtual platform for the delivery of a range of innovative digital content for teaching and learning. It may be solid and a little clunky. It may not be very exciting to play with. But it’s reliable and it does what it says on the tin. What more is needed?